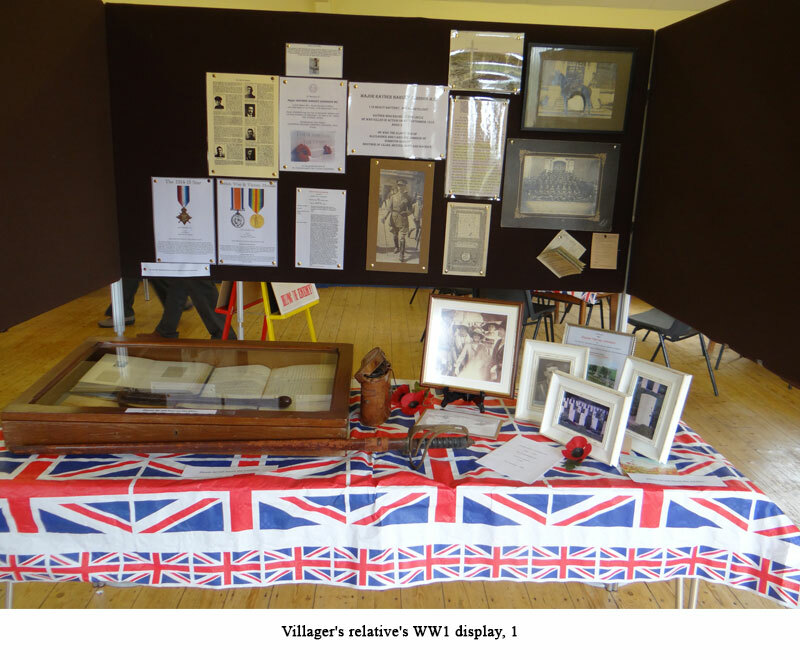 Elmswell Millennium History Group’s exhibition in the Wesley Hall commemorated the 100th Anniversary of the Great War, and was attended by approximately 300 visitors who were mainly from the village, but also from many surrounding Suffolk towns and villages, as well as several other counties, Wales, Scotland and even one from Canada! 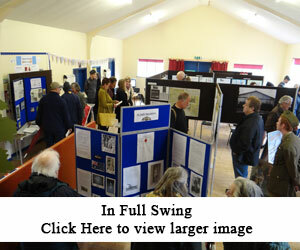 They all came to learn about Elmswell’s WW1 airfield, where the 75 (Home Defence) Squadron of the Royal Flying Corps was based, discover some aspects of social history in the village during those war years, as well as seeing many details and artefacts about relatives of villagers (including two holders of the Victoria Cross) who had served in the Great War. 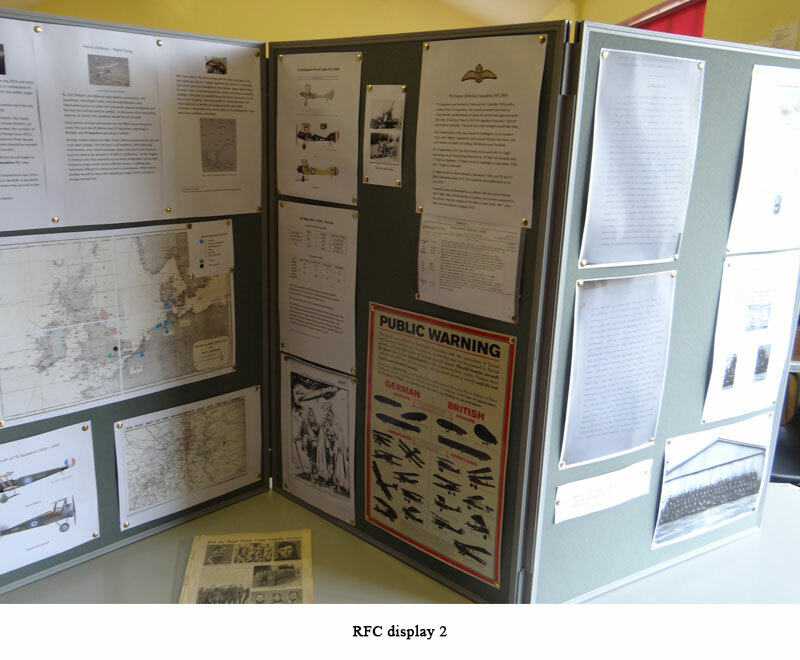 The exhibition was kindly opened by Stephen Miles, local farmer and owner of the airfield, who has been extremely enthusiastic and helpful to History Group members when exploring the old aerodrome. 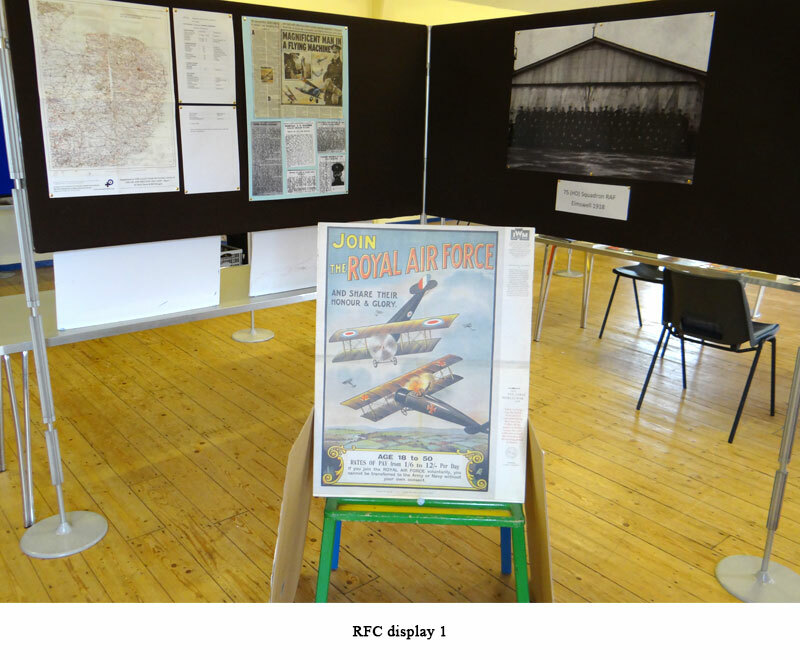 This research and exhibition came about because the History Group realised that, although there was plenty of information available about Elmswell’s WW2 experiences and the Americans at Great Ashfield Airfield (as it became known), there were far fewer details on WW1, and particularly about Elmswell Aerodrome (as it was first known) and the Royal Flying Corps based there from 1917. 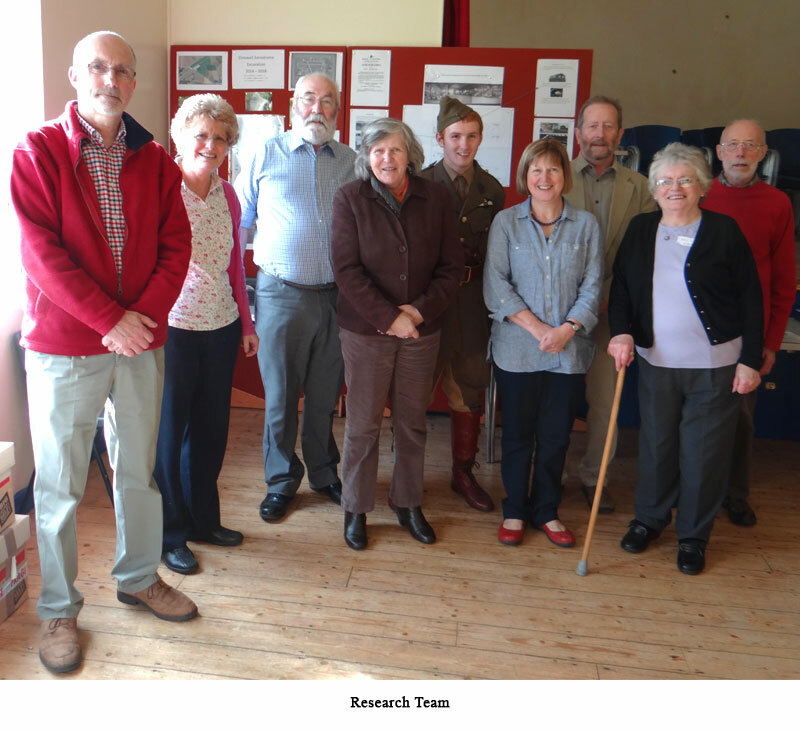 So, over the past year, History Group members and friends have been busily researching as much as they could about the 1914-18 years. 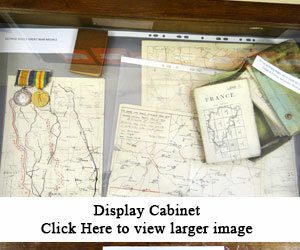 They have pursued several strands of enquiry which have taken them to original sources in the Record Offices at Bury St Edmunds and Ipswich, the National Archives, London’s Imperial War Museum and RAF Museum, Stow Maries Museum in Essex, as well as liaising with neighbouring history groups (particularly Drinkstone) and attending regular “digs” at the airfield site for which they received advice from Suffolk County Council’s archaeological service. 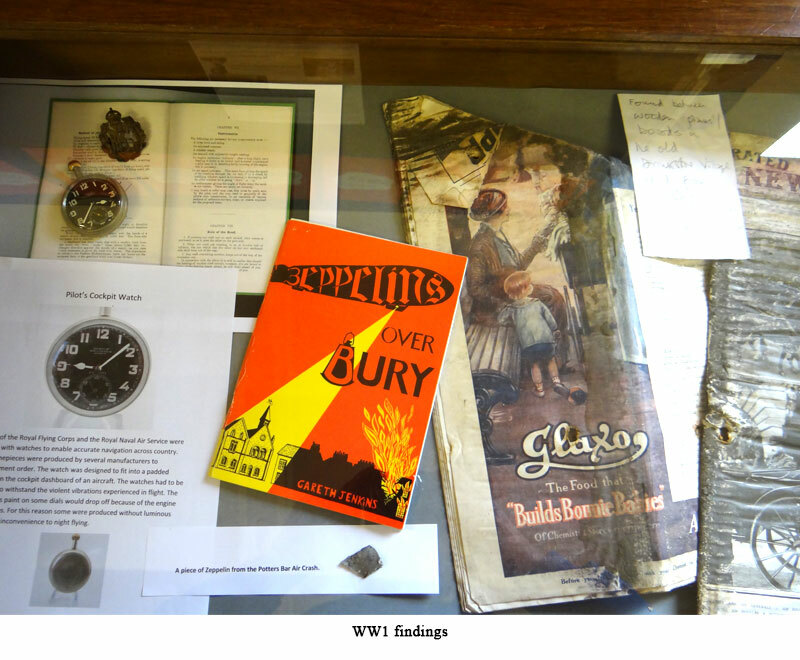 Some of the stories uncovered were of personal tragedy and sorrow, but they were counter-balanced with other exciting and fascinating discoveries. 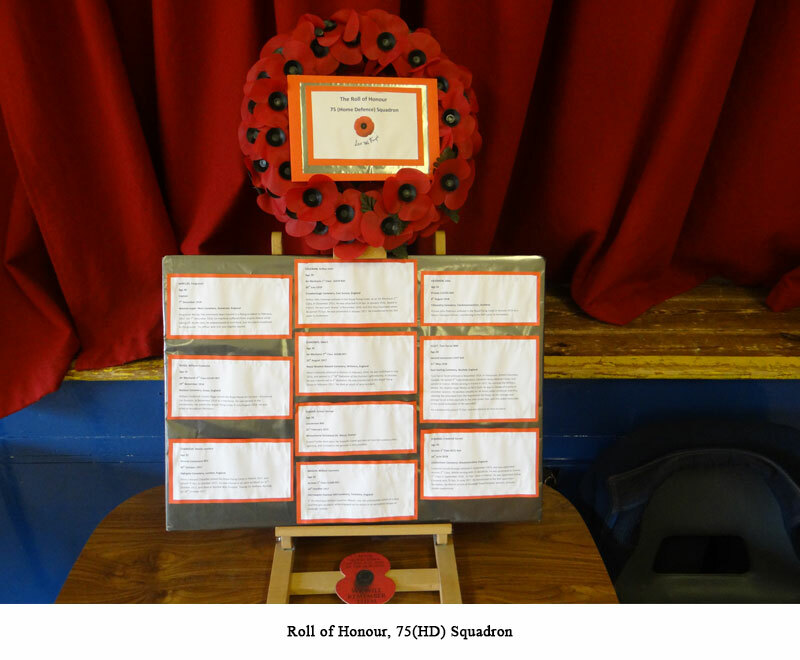 The Royal Flying Corps 75 (Home Defence) Squadron was formed in October 1916 in response to the German air raids on England. 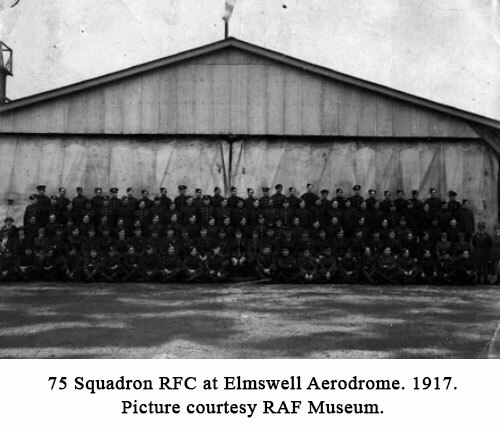 The squadron moved to Elmswell on 9th September 1917 where it stayed until 22nd May 1919, and the unit also had ‘Flight Stations’ at Harling Road (Norfolk) and Hadleigh (Suffolk). The young pilots were required to fly at night, an extremely hazardous activity in primitive BE2c and BE12 aircraft, with few rudimentary instruments and no heating or oxygen to sustain them at heights of 10,000 feet or more. 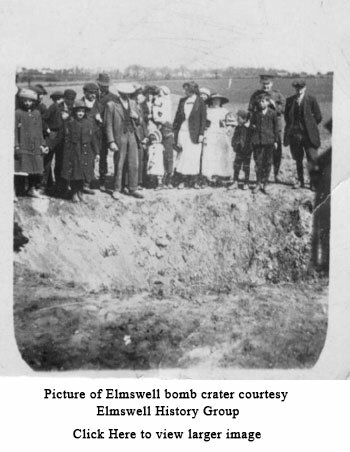 Many pilots were injured in crashes, and some were sadly killed. Although 75 (HD) Squadron never successfully engaged the enemy, it did perform a vital role in the development of the World’s first integrated National Air Defence system – something from which the country was to benefit 22 years later. 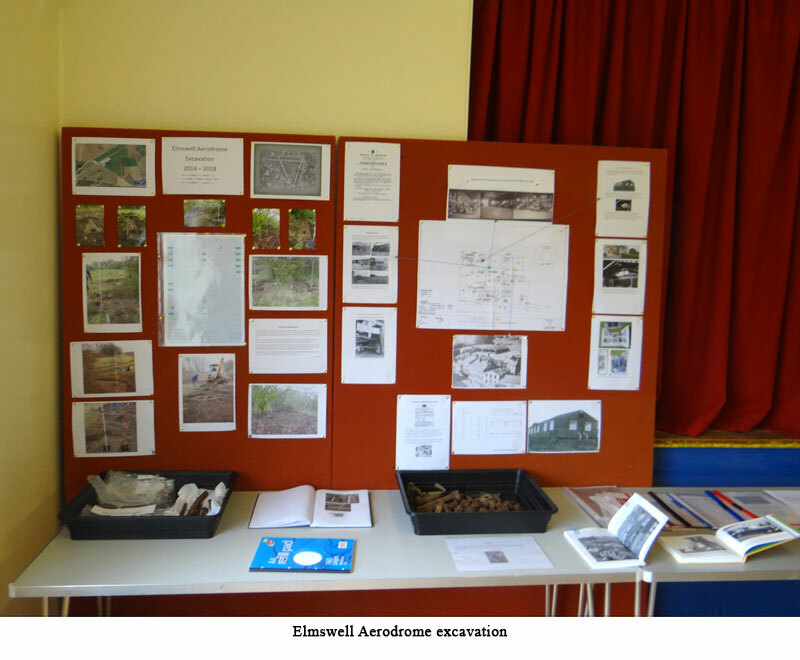 The History Group’s research is continuing to uncover the identities and deeds of the men and women who served at Elmswell Aerodrome during the Great War. 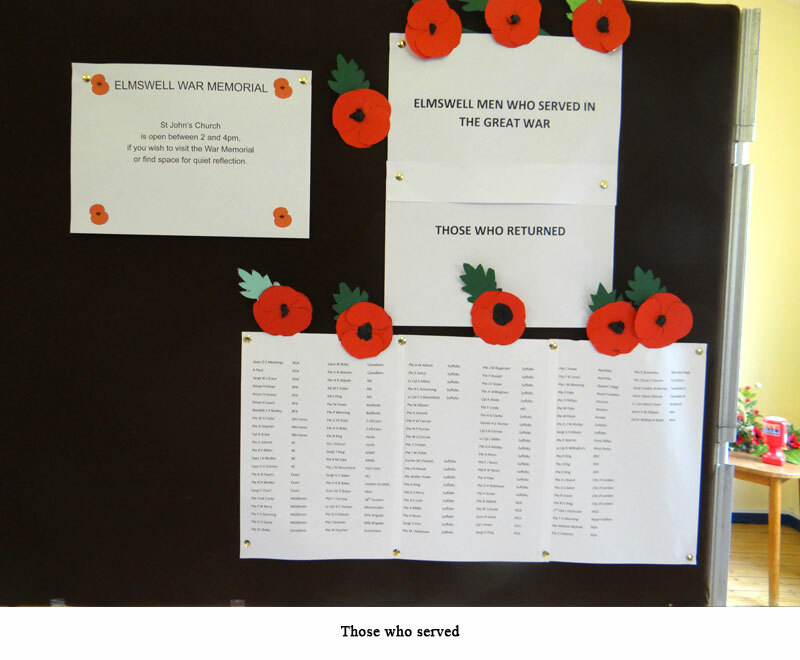 There is no village memorial or marker for their contribution to the war effort, but this project will go some way to rectifying that omission. 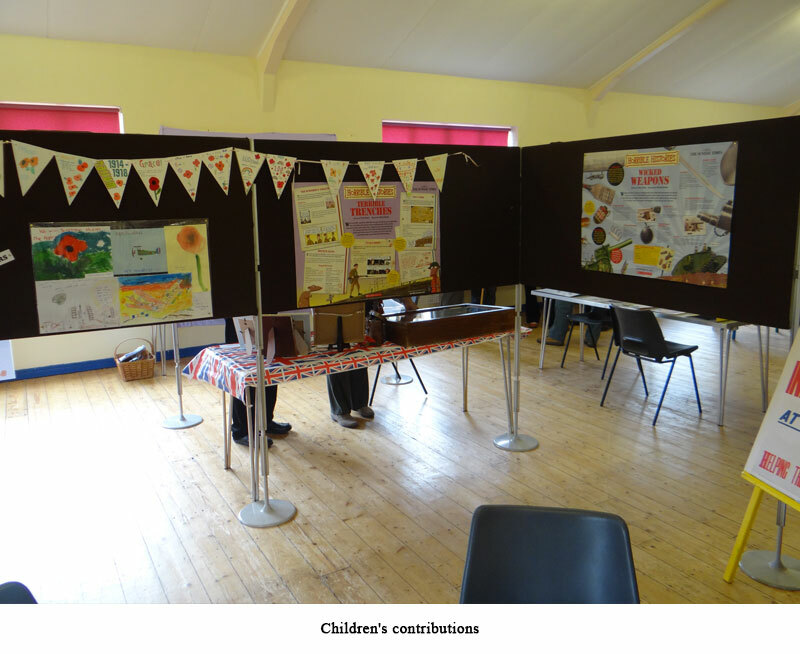 The exhibition offered a tribute to a generation of young men from Elmswell who died during the war, detailing all the known facts of each one separately, but also acknowledging the huge contribution of those men who served on the war front and returned home. 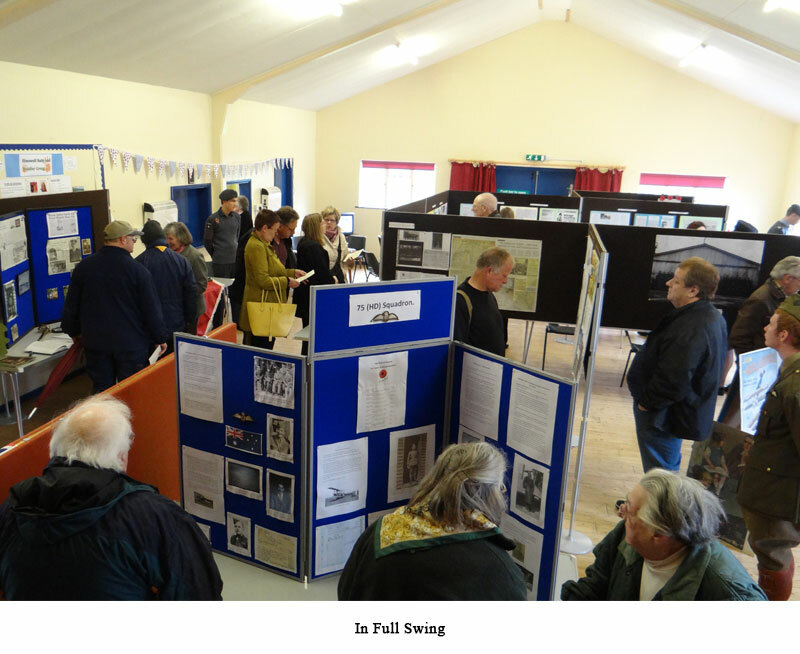 Many extracts from local newspapers of 100 years ago were displayed, as well as photographs of village life during those years, which helped to fill in some of the gaps of knowledge about wartime Elmswell. 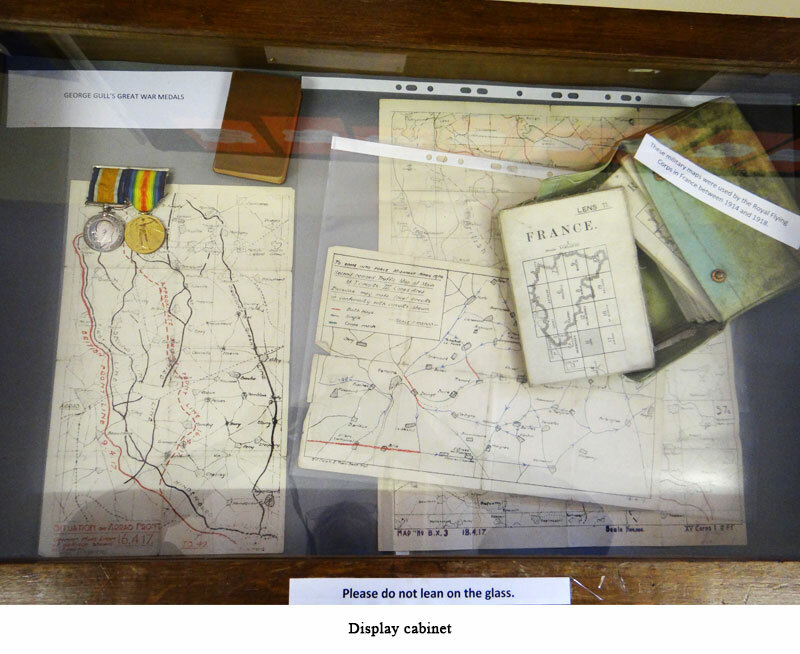 Though censorship generally prevented the detailed reporting of military activity, newspapers told us a great deal about the way of life at that time. 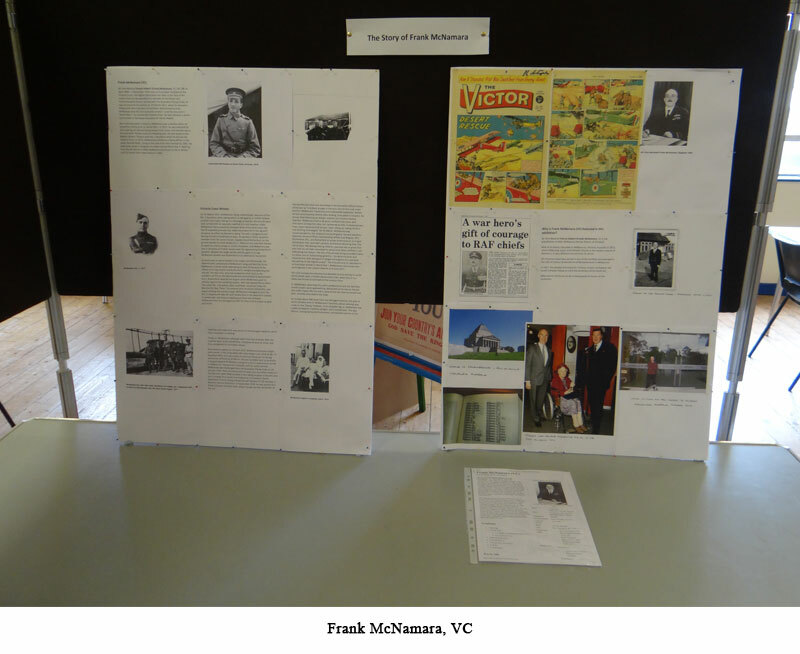 Also displayed were a few accounts of ordinary lives, often doing extraordinary things, and some vignettes told us of people living in the village then, and others told us of those whose relatives still live here now. 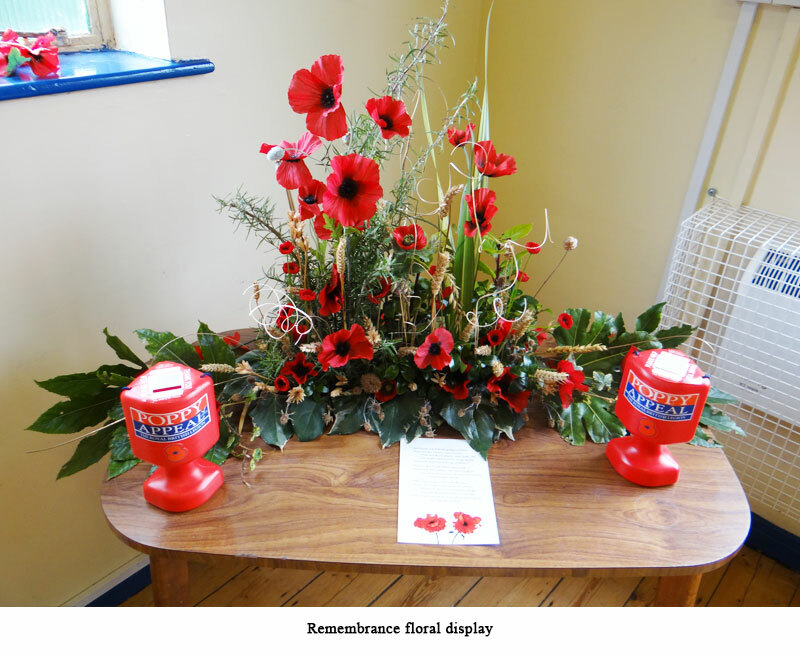 However, all reminded us that everyone, everywhere was affected by the Great War in significant ways. 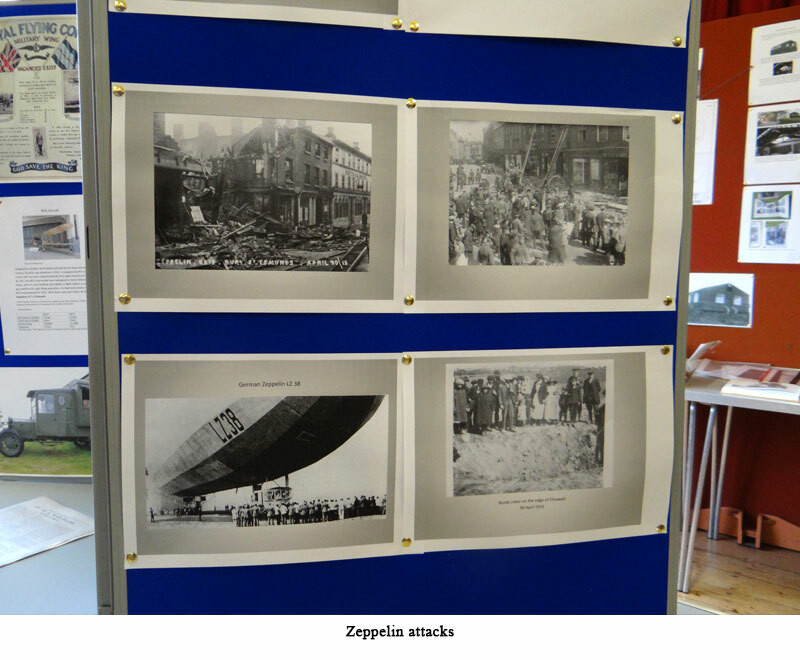 The History Group’s sincere thanks go to Elmswell Amenities Association and our wonderful Fire Officers who donated so generously towards the cost of mounting this exhibition. 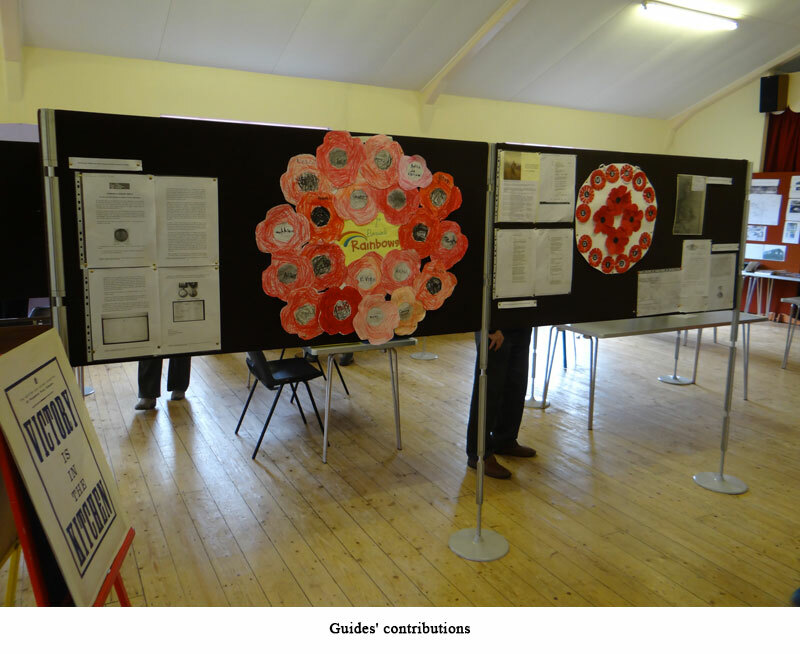 In addition, many thanks go to all the researchers, contributors of colourful poppy artworks and floral arrangements, children’s competition entries and displays, information and artefacts from far and wide, including from our former Rector Mike McNamara in Australia. 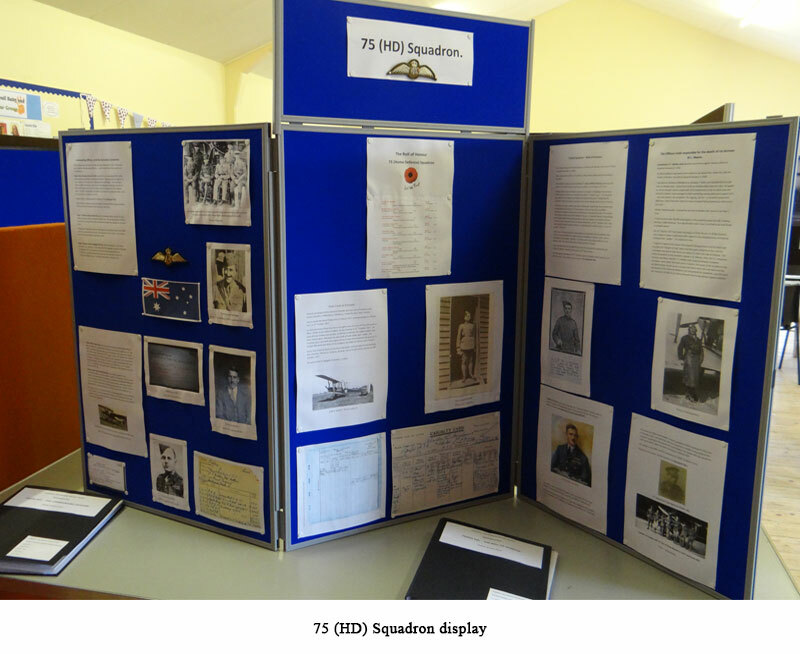 Others provided WW1 contemporary music and newsreels, and the History Group thanks all helpers before, during and after the exhibition’s two days, including members of Thurston and Stowmarket’s Air Cadets. 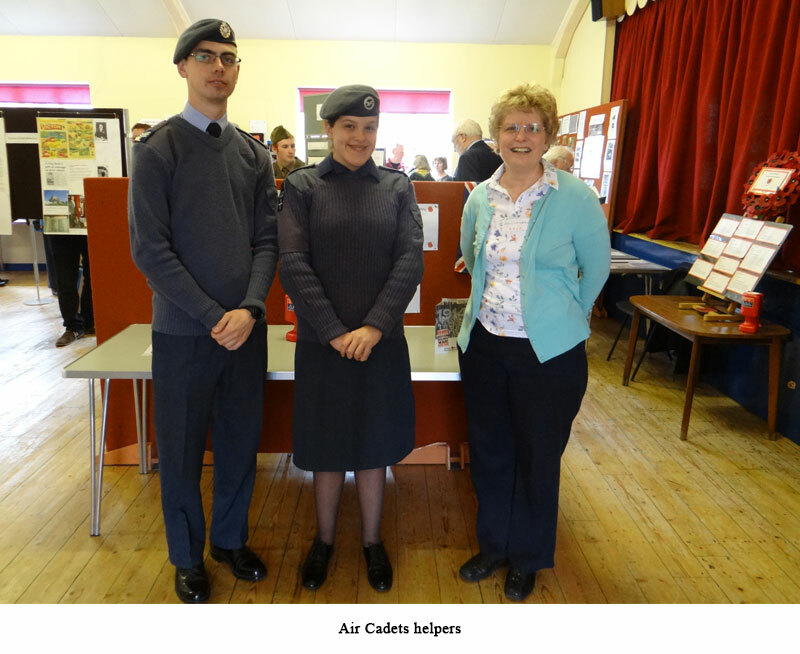 As the Royal Flying Corps is the forerunner of our present-day Royal Air Force, it is hoped that the air cadets will have learned something of their organisation’s local history. 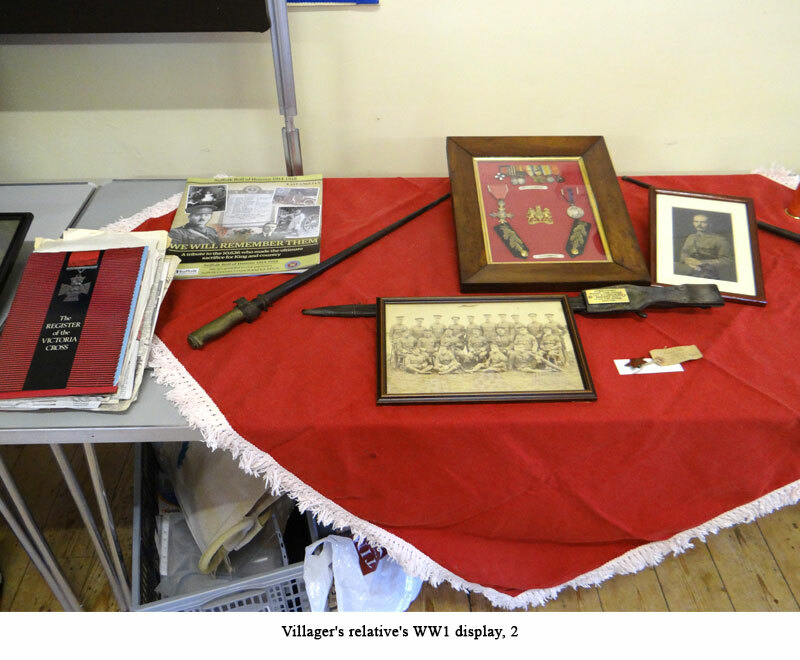 We must not forget our stalwart RFC officer in attendance throughout the exhibition in his authentic WW1 officer’s uniform, who kept a military eye on proceedings! 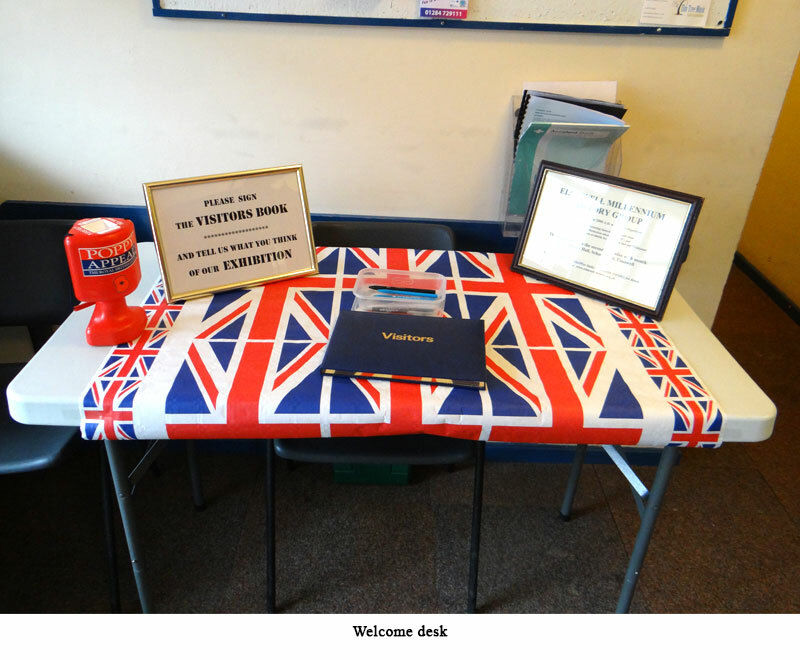 All this help and effort was very much appreciated, and made for a very special and moving weekend. 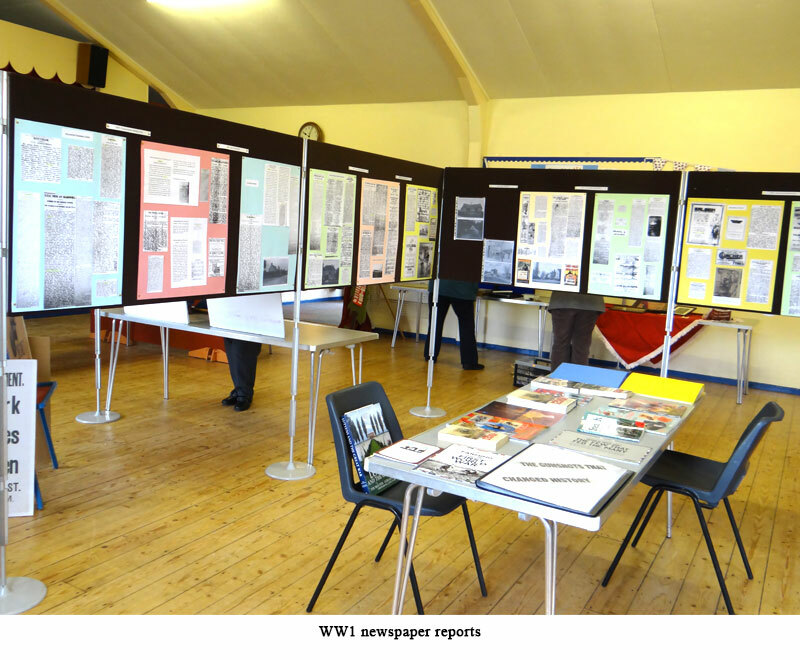 After all the sustained work and delving into archives, it was gratifying to receive such enthusiastic encouragement and grateful thanks from so many of the visitors that weekend. 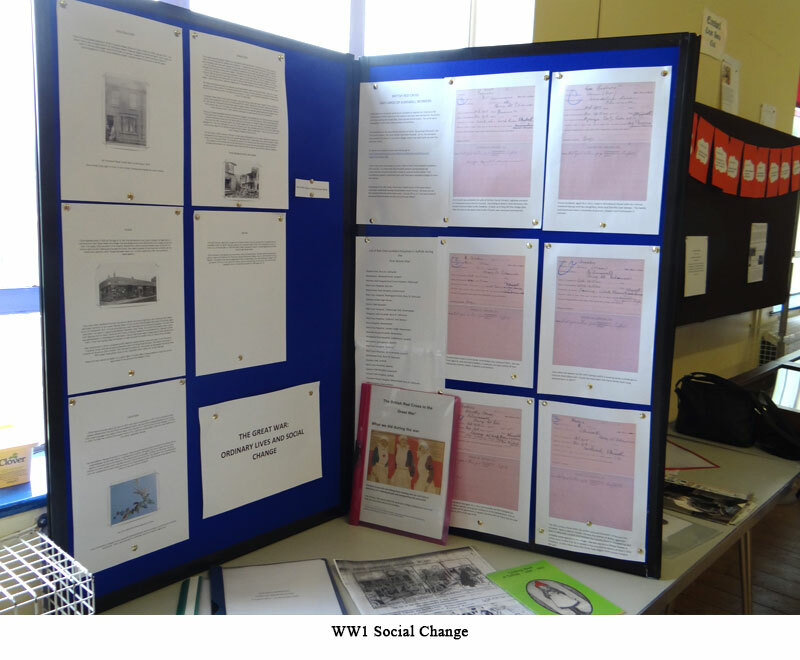 The research presented at the exhibition over the weekend is ‘work-in-progress’, and the History Group members and friends plan to continue their researches, with the hope of putting on a second such exhibition in 2018-19 to mark the 100th anniversary of the Great War’s end. 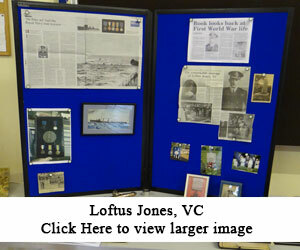 If you would like to join them and can loan materials (diaries, letters, recollections, photographs, medals, etc.) 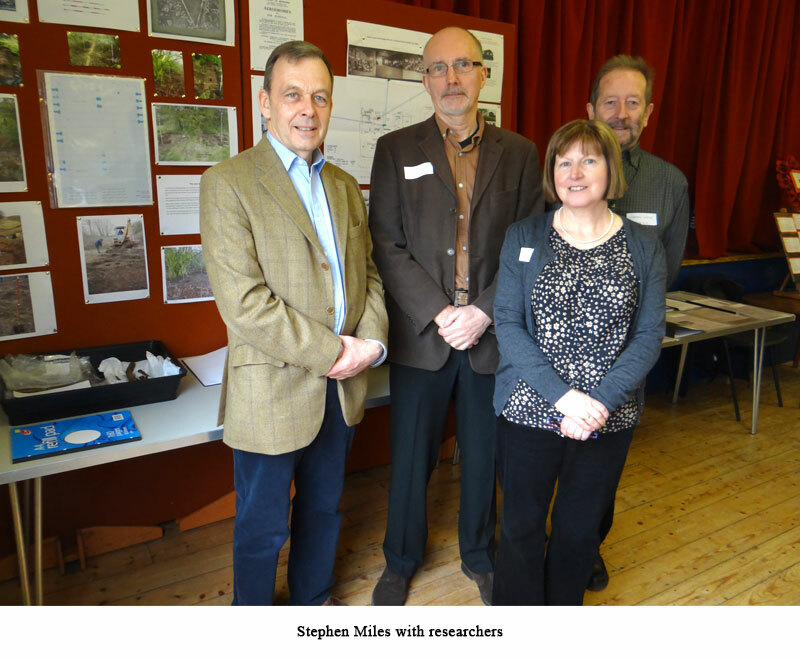 or have ideas for this Great War project, please contact History Group members involved with this project – Anne & Peter McGee (01359-244001), Stella Chamberlin (01359-242601), Graham Mack (01359-408130), or Jean & Derek Folkard (01359-242099). 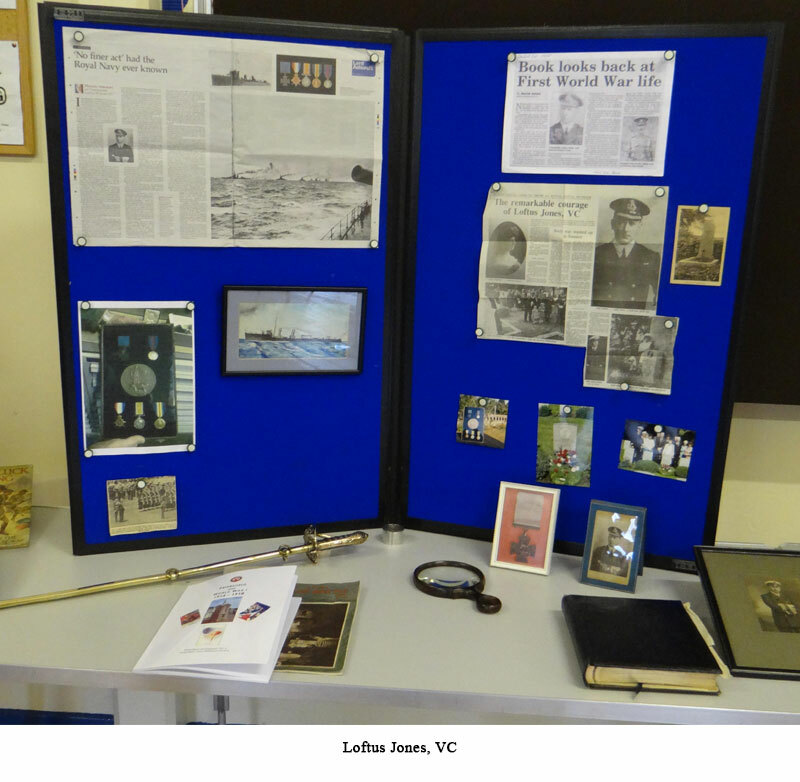 Last but not least, many thanks to everyone who donated to the exhibition’s retiring collection for the Royal British Legion which totalled £219.